If there is one city which has really cleaned up its act in the hospitality and tourism department over the past forty years, then it is undoubtedly London. The awful, yet hilarious, once-familiar standards of service and food espoused in shows like Fawlty Towers has largely been banished. Whatever direction London, and indeed Great Britain takes post-Brexit – if it happens at all – at least one thing is now certain: residents and visitors alike can no longer complain that their hotel options are limited to the number of fingers on one hand. Today, the dilemma is where to start, rather than a lack of choice. This brings me nicely onto the Great Northern Hotel. When friends and family ask for a recommendation – in essence, to single out one hotel amongst the crowded competition, I inevitably mention this boutique address because it remains one of the most friendly and vibrant hotels in the UK, with quite a history to boot. 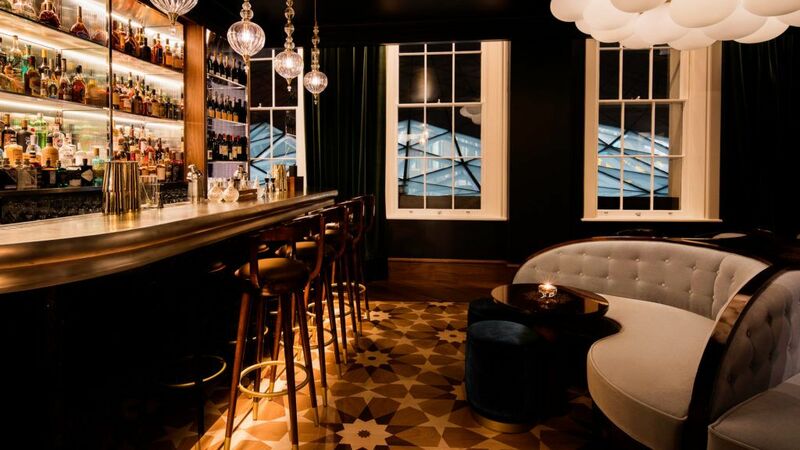 A stone’s throw away from King’s Cross station itself, The Great Northern was the UK’s first boutique hotel to open in the 19th century, designed by the Victorian master builder Lewis Cubitt. It offers 88 high-spec rooms, with bespoke furniture and all the obligatory trappings of a luxury hotel. But perhaps the hotel’s biggest asset is its signature restaurant – the Plum and Spilt Milk. It’s an enticing proposition when staying in London, particularly after a day of tedious board meetings. It’s a hotel that can cater to all your needs, both practical and culinary; I know that if I stayed frequently at The Great Northern Hotel, I’d never venture out. However, we did take the time to explore the hotel’s newest addition during my last visit – Anthracite. The bar opened last year, and is intended to replace the Snug Bar with a much larger space that has clearly benefited from a gargantuan investment. It’s a martini lounge housed in a supremely classy package – decorated in dark tones, with metallic details and electric blue trims, the comfortable booths were determined to make us stay put. The concise cocktail list naturally offers perfectly stirred martinis, in addition to a selection of timeless and more unusual cocktails. My Manhattan was spot on, while ‘Lost in Translation’ – a heady concoction of gin and sweeter, fruit-driven elements – was both balanced and very addictive. I ordered several more, before taking the few steps necessary to arrive at the adjoining Plum and Spilt Milk. This was my third visit, and I’m always amazed at how the restaurant manages to feel buzzy even on a relatively quiet Monday evening. 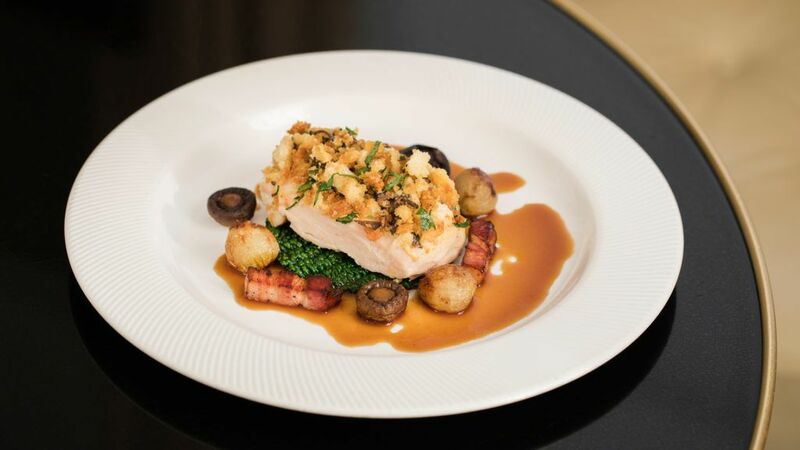 It continues to be presided over by head chef Mark Sargeant, a former protege of Gordon Ramsay. 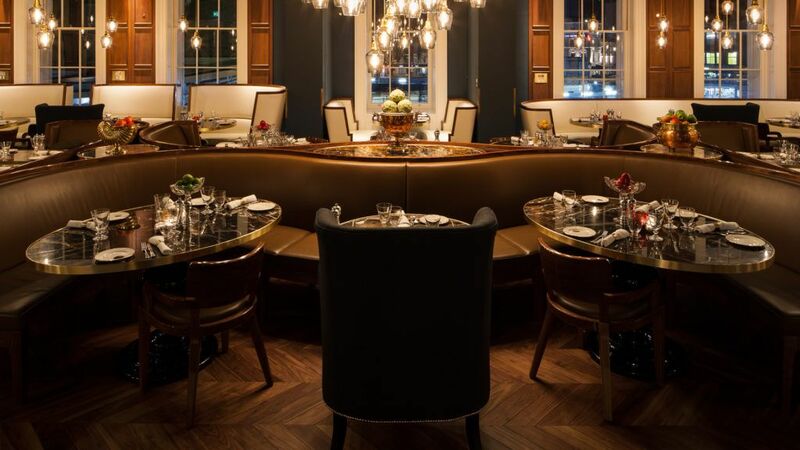 Yet, even committed teetotalers and healthy eaters will find something to love here; the dining room is worth the price of a meal alone, a gorgeous, atmospheric and softly-lit space which is modelled on an 18th-century dining car. They serve food here from dawn until dusk. You dine in semi-circular booths softly lit with low-level ceiling lanterns. We welcomed two glasses of Champagne – and then we were off. The Plum and Spilt Milk’s key USP is that it consciously avoids fuss and faff. Molecular cuisine? You better go somewhere else; our feast was hearty, calorific, and probably slightly unnerving to the figure-conscious. But what a way to go – deep fried pork belly, encased in breadcrumb and served on a bed of baby spinach, turnip and pear remoulade, all rounded off with a whisky-mayonnaise sauce, speaks for itself. One serving will not suffice, that combination of rich, fatty meat and crisp/ crunchy texture was unbelievably moreish. Main courses were an ensemble of meaty heaven – one medium and one medium-rare steak, cooked to absolute perfection. I don’t know what it is about chargrilled meat, but it silences all the cautionary instincts and does things to my pleasure receptors that verge on scandalous. As my companion put it: “No dish that includes Cornish beef can ever be bad.” Of course, that deeply-flavoured, gamey quality cannot be to everyone’s taste, but the accompaniments – triple-cooked trips and a moreish Bearnaise sauce – will find few detractors. Service is another strength, which is probably why the restaurant has endured, while other venues have crumbled. Nevertheless, I cannot help but feel that the Plum and Spilt Milk is sometimes unwisely overlooked by critics. The owner isn’t a media star, and consequently the restaurant doesn’t seem to garner that much attention. Moreover, it could so easily trade on its buzzy setting and serve mediocre food. Thankfully, this place is the real deal. Day after day it just quietly gets on with the business of serving fantastic food in the most convivial and sophisticated of settings.